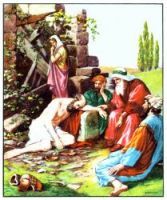 After Job's great proof and triumph of his faith in God, the Job Story continues with Satan declaring to God that the greatest suffering is actually that of personal affliction. The Lord told Satan that he had not tested Job far enough. He bade Satan try Job with physical illness, and Satan savagely accepted the mission, covering Job's body with painful boils. Still, Job accepted this bodily torment with philosophic calm. But Job was to be afflicted with other trials: first his wife came to despise and deny religious faith. Then Job's friends confronted him with more subtle tempations of doubt and questioning during their discussions. 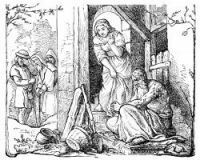 Job's friends, Eliphaz, Bildad, and Zophar, initially came to mourn with Job and give him comfort, but ultimately, they became his enemies. They insisted on denying Job's goodness, on closing their eyes to it. They cling to their worldy view that we must measure results only by this life and by its material prosperity, that here, and now, a man must have practical payment in wealth and friends for all his spiritual uprightness. Job scorns the three for their obstinancy. He declares that God watches men, and measures their deeds, but the workings of His Will are beyond human interpretation or understanding. His justice must be of the future. This page of drawings from the Job Story are taken from my collection of old books. You're welcomed to use these pictures of the Job Story in your artistic projects. Click on the Job Story illustrations below to see more details about saving a free Job Story image or about purchasing the images of the story of Job at a higher resolution.